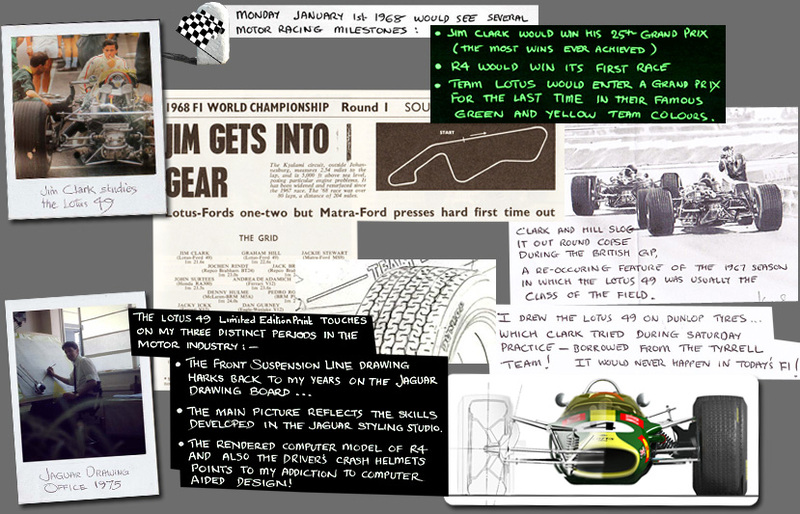 Lotus 49 40th Anniversary - Limited Edition Print of Jim Clark's Lotus 49. A sublime artistic study of one of the greatest Grand Prix cars of all time, the Lotus 49. I have included technical elevations, racing scenes and a record of which chassis won which Grand Prix. Monday January 1st 1968 . . would see several motor racing milestones: Jim Clark would win his 25th and last Grand Prix ( the most wins ever achieved ); R4 would win its first race, and Team Lotus would enter a Grand Prix for the last time in their famous green and yellow team colours. The main drawing shows the Lotus 49 on Dunlop tyres, which Clark tried during Saturday practice, borrowed from the Tyrrell team! Would never happen in today's F1!!! Clark and Hill slog it out round Copse during the British GP, a re-occuring feature of the 1967 season, in which the Lotus 49 usually had the advantage over the rest of the field. The Lotus 40 Limited Edition Print touches on my three distinct periods in the motor industry: The front suspesion line drawing harks back to my years on the Jaguar drawing board; the main picture reflects the skills developed in the Jaguar Styling Studio; The rendered computer model of R4 and also the driver's helmets points to my addiction to Computer Aided Design! I drew the Lotus 49 on Dunlop tyres which Clark tried during Saturday practice - borrowed from the Tyrrell Team! It would never happen in today's F1!